The history of Deaf Education, and as much, the Deaf Community in the United States is closely interwoven with the Gallaudet family, starting with Thomas Gallaudet, which eventually passed on to his son, Edward Miner. The establishment of Gallaudet University, as the only degree-awarding institution for the Deaf of its kind in the world, is credited to Edward Miner Gallaudet’s pioneering efforts. Edward Miner Gallaudet (“E.M.G.” for short) worked at the College for fifty-three years, starting as Principal of Kendall School and retiring in 1910 as President of the College (Gallaudet became a University in 1986). It was E.M.G. who made frequent trips to the “Capitol Hill” to befriend prominent politicians and wealthy patrons who would financially support the needs of the College for the deaf-mutes. E.M.G. pushed for growth in every aspect of the College, from increasing enrollment, to resources capacity, and the continuing in building new facilities on the land. According to reports (preserved in the Uni- versity Archives) and the book written by E.M.G. on the history of the College, E.M.G. made a journey to Europe in 1867, for six months. What intrigued me was the purpose behind the trip, that the College funded, was that E.M.G. would investigate all the methods available (and used) at schools for the deaf in Europe and determine the most efficient method to bring back to the College. This alone prompted more questions: Which schools for the deaf did E.M.G. visit? How long was he in Europe? What did he discover during his trip and brought back to the College? Were there any specific changes for Gallaudet College influenced by the educational methods of the deaf in Europe? Moreover, did E.M.G. bring any kind of influence upon counterparts he visited in Europe? I decided I would investigate this trip E.M.G. made to Europe in 1867, and find out the answers to my questions. This led to the discovery that E.M.G. made a total of ten trips to Europe in his lifetime, in which I decided to chronicle, and examine each trip’s purpose and to what extent did each trip result in. More signi- ficantly, his trips included attending the Milan Congress in 1880, and the equally oral-backed Paris Congress in 1900. I had more questions concerning the role E.M.G. played as a delegate in those two Congresses which brought tremendous support for the oral method as the method of instruction in schools of the deaf, inevitably putting a negative impact on sign language use and the employment of deaf educators. In this research and the examination of the ten trips E.M.G. made to Europe, I decided that to best describe the journeys, purposes, and outcomes were to put everything visually. 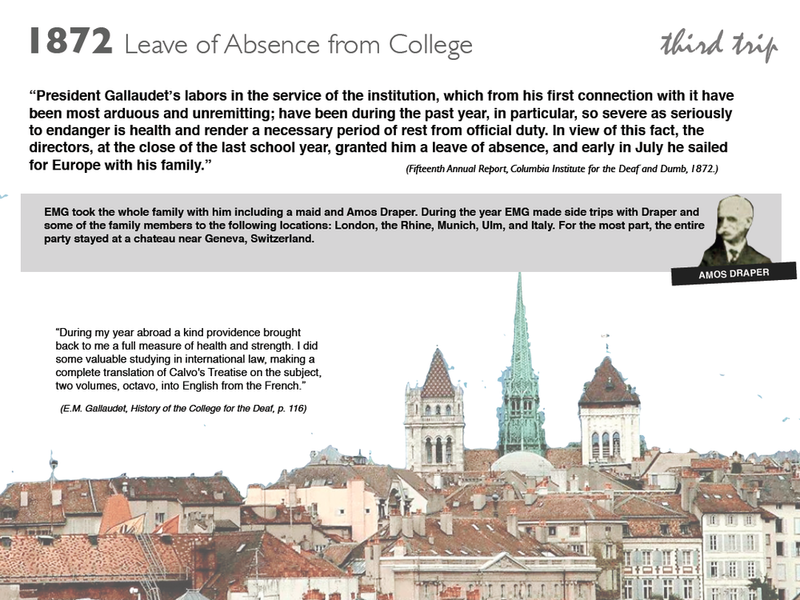 Therefore I designed a visual essay to completely chronicle the European travels of Edward Miner Gallaudet. For the complete visual essay, go here. I also presented on this at the Deaf History International conference in Stockholm, Sweden in 2009 and published the visual essay in the conference proceedings.